You may think the UK is limited when it comes to spaces to have the perfect off-road experience, but you’d be surprised! We’ve compiled the top places from around Great Britain to get your wheels muddy, as well as some safety tips, for whichever type of off-roader you’re into. Motocross sport, formerly known as scrambling, has its roots in the UK and is undeniably one of the most demanding motor sports. MX takes strength, skill, agility and cat-like reflexes as well as a serious amount of gear (think boots, gloves, helmet and throw in chest and back protection and even a neck and knee braces). Anyone new to motocross should know it’s not a beginner’s off-road sport. Most of the practice tracks around the UK will hire out the track only; you will be expected to have your own gear and bike, as well as an appropriate level of experience. 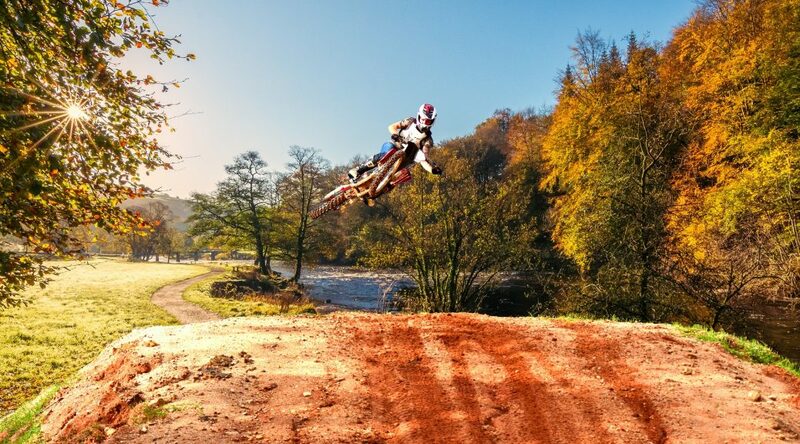 Professional rider, Ben Watson, suggests hitting local trails and woodland tracks with a BMX or mountain bike to get used to riding in the dirt. There is also the option of joining a motocross training school such as those run by KTM or The MX Training School for pro tips and riding experience. Fatcat Motorparc, in Doncaster, boasts one of the toughest circuits that England has to offer. However, as they have 3 separate tracks, they can cater to virtually all ages and abilities which is great for new starters and experienced riders alike. Besthorpe Motocross Track, situated in Norfolk, is open for practice days on Wednesdays, Saturdays and Sundays, as well as bank holidays. They have 2 tracks, a regular and a junior track, and welcome riders of all abilities – from novice to expert. Another great way to practice motocross on a regular basis is to join a riding club. There will likely be a joining fee and entry charges for meetups or races, but with that comes a degree of organisation, safety and supervision during rides. Desertmartin, in Northern Ireland, was purpose built for the MX Grand Prix and offers a challenging yet spectacular riding experience for its members. Most of today’s SUVs and 4x4s never see a speck of mud, let alone roam around an all-terrain track. There are plenty of places around the UK where you can tear up a muddy field and fling a bit of top soil around. But really, there is nothing quite like clambering over rocks and boulders, charging through rivers and getting well and truly stuck in the mud with a 4×4! If you’ve never been on a private off-road course before, be prepared to walk the route first as part of the initial risk assessment (suitable clothing for being out on the course is advisable). This is an important aspect of safety management and is even a technique that some grand prix racers use to familiarise themselves with a track. Whitecliff 4×4 Driving centre, near the Forest of Dean, Gloucestershire, offers an unparalleled off-road experience. The quarry-based site features steep inclines and declines, cross ruts, mud, water and cross-axle situations. They also cater to a wide-variety of abilities, offering intro, pro, adrenalin and even owner-driver courses (for those that want to test the mettle of their own vehicles). Ultra Adventure Driving in Wales not only have their own private off-road tracks, they also use spectacular, scenic tracks in the Ceriog Valley as well as ‘old Drover’s routes’ in the Berwyn and Clwydian mountain ranges. There’s plenty of opportunity for off-road adrenaline, but also the chance to take in the local geology and wildlife too. The brilliant thing about quad bikes, or all-terrain vehicles (ATVs), is that they are agile, can conquer pretty much any ground and are relatively easy to ride too. They offer similar prowess to a 4×4 vehicle but with the full-on user experience of a bike. However, as with a bike, the rider is very exposed whilst using the vehicle. Basic safety measures like tough, protective clothing that will also keep you warm and dry is a wise choice. As the name indicates, an all-terrain vehicle can encounter, well, all terrains! So be prepared for mud, grit and gravel to come your way. Protective head gear is essential as there is no roll cage or bodywork to protect you if the quad overturns, or if you come across obstacles such as low-lying branches. In terms of taking your own quad bike, it’s more likely to be a practice track rather than an off-road course that will allow you to do this. If you’re going to use your own ATV on a private track, check ahead to make sure that your quad meets all the required safety standards, that you have the appropriate safety gear and that you have adequate quad bike insurance where necessary. Ashby Moto Park is the one of the best off-road Enduro practice tracks in the country. Located in the Midlands, the park features a ‘demanding and technical Enduro section’, as used by top Enduro and Motocross riders alike. The track is also available for hire for use by quad bikes. Nae Limits in Scotland offers riders the opportunity to traverse ravines, plunge into rivers and get down and dirty in the best that the Scottish countryside has to offer in any season – if you dare! With 3 separate locations to choose from, there is a course and experience level to suit all. No matter whether it’s high-octane thrills, fine-tuning your agility and riding skills or even just a love of exploring the great outdoors (with an engine), the UK has such an exciting variety of tracks, courses and clubs to get involved with, you’re bound to find something to suit your off-roading needs. Phoebe Conner is a Norfolk native who first learnt to ride on the unending (flat) roads of her home county. Since then her love of biking and off-roading has taken her from the Great British countryside to the mountains of the USA. no info about green laning its really fun and less frantic than MC. I did a days course at Off the Curb in Dorking last year it was great fun.